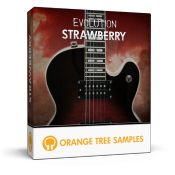 Evolution Electric Guitar - Strawberry Reviewed By ProRec Receives 9/10 Stars! In its first review to date, Evolution Electric Guitar - Strawberry was cited as "realistic enough to convince most every listener," "a tremendous value in the world of guitar samples" and likely to "find its way to the top of many buying lists." Read the full ProRec.com article for the rest of this extensive review.